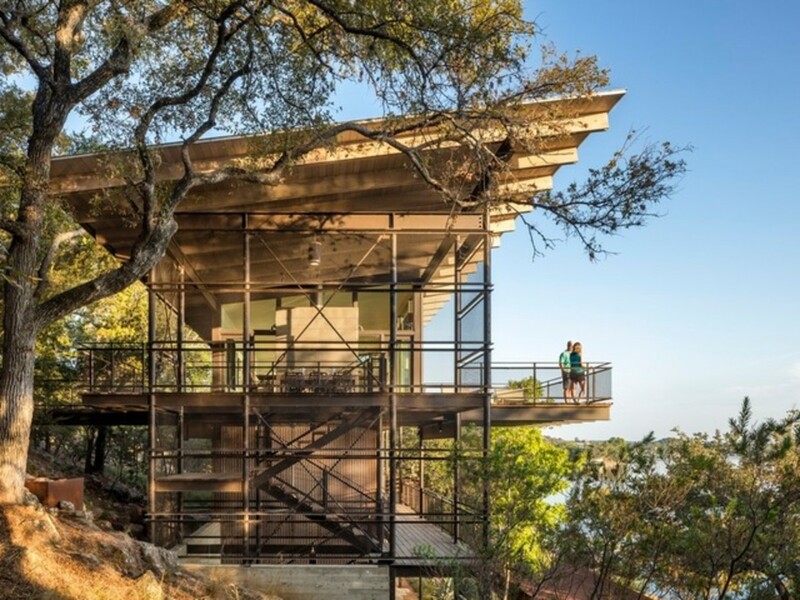 After decades of use, a beloved lakeside vacation home had seen better days. The owners, an active Texas family, decided they wanted a new home on the half-acre property, one that would better serve their needs for a casual indoor-outdoor gathering place. 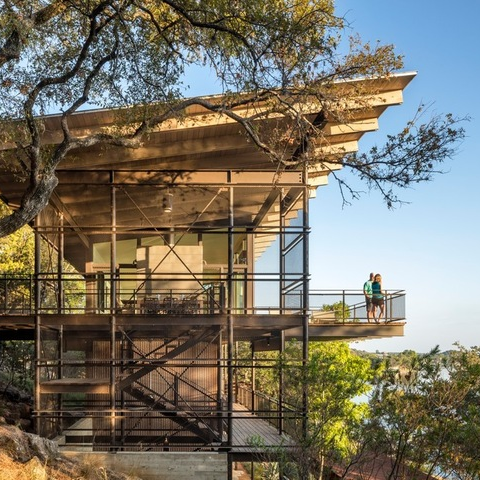 They turned to architect Ted Flato, principal and co-founder of Lake | Flato, who led a design team that created an airy, transparent, three-level house that addresses both the lake below and its steep hillside site. It also draws on historic fire towers of the West for its unique aesthetic. "The half-acre site had many challenges," Flato says. "An access road to other properties cuts through the lot. The lake and the boat dock are on one side of the road, and the buildable property is basically a steep hill. The only thing the property had going for it was the original excavation into the side of the hill where the old house once stood." Flato and his design team, which included Gus Starkey, Karla Greer, Matt Morris, Brian Comeaux, Cody Knop, and Mindy Gudzinski, came up with a three-level solution that rises out of the original excavation. The first two levels include bedrooms and bathrooms. The top level, with optimal views of the lake, includes the kitchen, dining area, and living room. 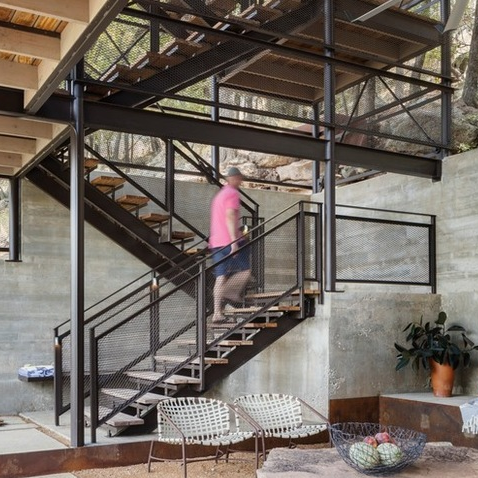 Inspired by fire towers, the house is supported by a bolted steel frame. 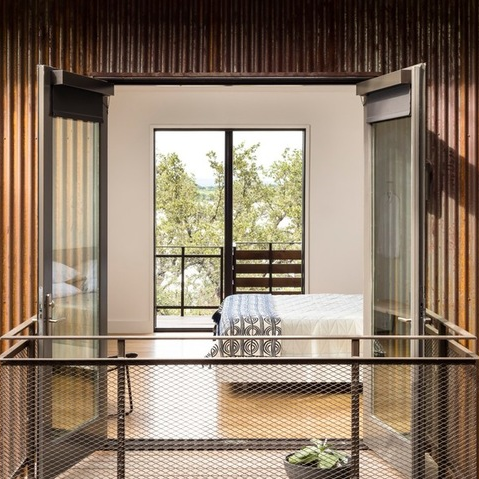 Metal, wood, and glass form the simple, maintenance-free building materials and help blend the home into the site. 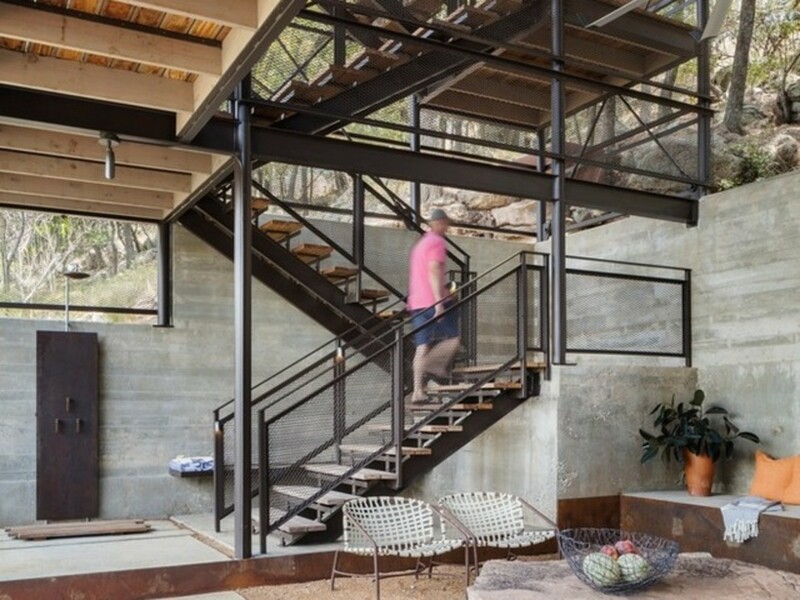 The exterior staircase, enclosed in a metal scrim, is the only way to access the different levels. "This is basically a tower that links two ecosystems — the lake and the hillside," Flato says. A metal and cumaru wood bridge leads from the upper level to the hillside, which is dotted with oaks and granite boulders. At the hillside end of the bridge, a fire pit and seating pull the owners away from the compelling lake views. The staircase on the right was moved away from the house to give the structure more of a sense of transparency. It also helps focus views on the lake and hillside instead of the house. 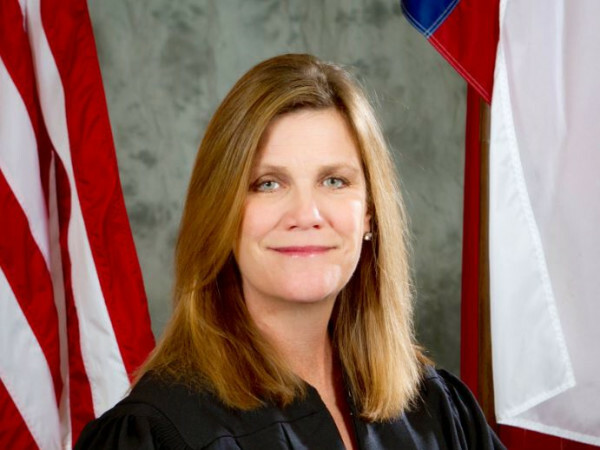 "The home has more exterior than interior spaces to connect the residents to the outdoors," Flato says. "All of the hallways are also outdoors." Concrete steps lead up the hill to the entry staircase and lower-level bedrooms. The hillside, revegetated by landscape architects Thompson + Hanson, retains strategically placed boulders that help slow rain runoff and provide pockets for plantings. 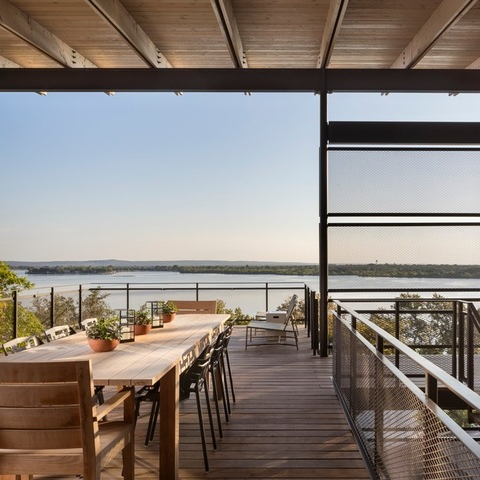 A cantilevered deck on the top level allows unfettered views of the lake. 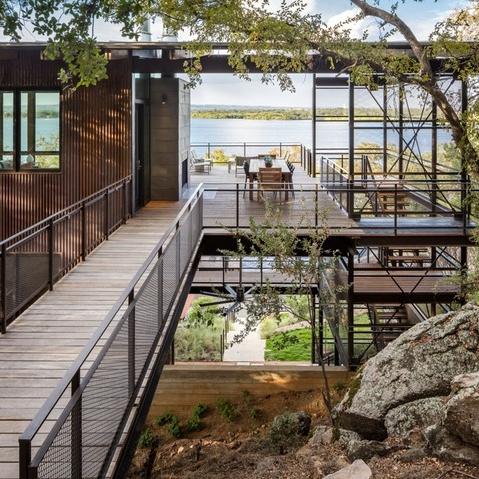 Placing the main living area and decks on the third level was another architectural strategy to keep eyes focused on the lake rather than the road. The roofline angles up to the north, toward the lake, giving living areas the benefit of north light without heat gain. The entry staircase starts at the lower level against the hill in what was the excavated area for the old house. New concrete retaining walls reiterate the home's simple palette. The design team created a protected patio with elements that include a metal-faced bench integrated into the retaining wall, a boulder from the site craned in to serve as a cocktail table, and gravel underfoot. Vintage Brown Jordan chairs add a midcentury touch. An outdoor shower provides a place to rinse off from the lake before entering the house. The rectangular concrete "stepping stones" lead to the two lower-level bedrooms. 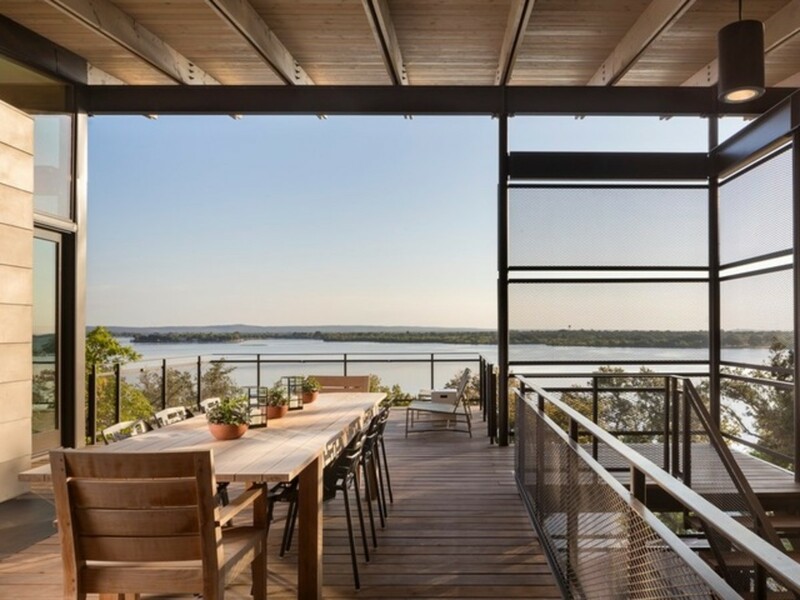 A cantilevered deck serves as an extension of the living room, accessible through the glass door. It's the perfect place to wind down after a day on the water. The outdoor dining area is tucked under a roof on the upper level and has views of both hill and lake. The fireplace mass is clad in simple paint grip metal siding, while the Douglas fir cladding on the ceiling adds warmth. The design team kept the lighting to a minimum so the owners could enjoy the stars and moonlight. Interior designer Hilary Crady of Plus Two Interiors worked with the homeowners to choose furnishings and finishes that complement the architecture and fit in with the casual, vacation-home ambience. 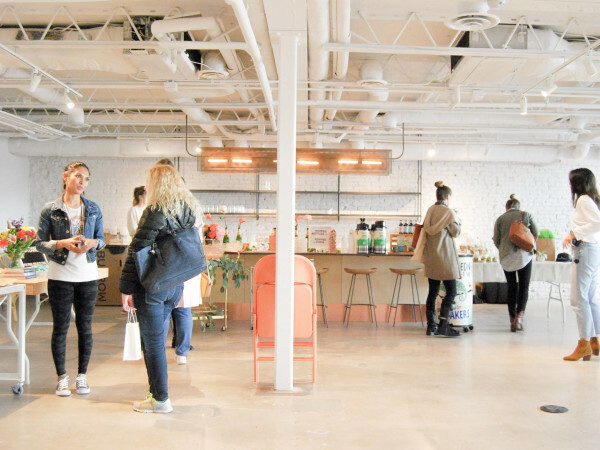 "Everything here had to be serviceable and practical," says Crady, who's based in Houston. "It had to withstand wet bathing suits. 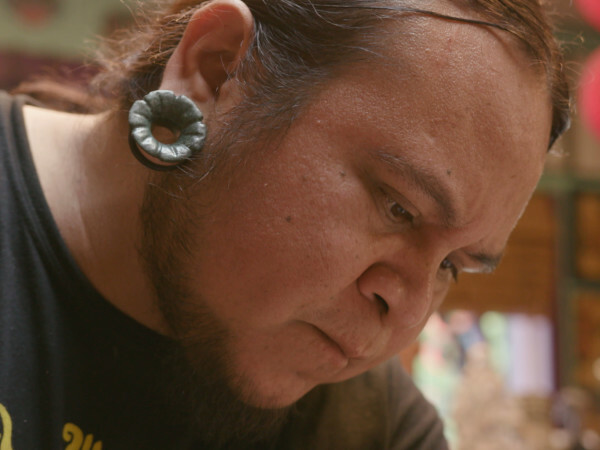 Since this is a second home, we also mixed in a lot of cost-efficient pieces." In the living area, a comfortable sectional angles toward the fireplace and windows; the sectional is covered in an outdoor fabric, so post-lake lounging is welcomed. Working with a color palette of cool neutrals inspired by the lake, sky, and forest, Crady kept the focus on the views with sleek, low-key furniture that also speaks to the wife's love of midcentury modern design. A metal valance near the top of the windows hides roll-up shades and is fitted with uplighting, which illuminates the ceiling plane by night. Operable windows and a zoned mechanical system keep air-conditioning use and costs to a minimum. The living room, dining area, and kitchen are all in one open space, unified by white oak flooring. The floor-to-ceiling windows face north toward the lake. The home is more solid toward the south — the hillside — to prevent heat gain. In the kitchen, rift-sawn white oak custom cabinetry and limestone countertops provide a warm contrast to the white walls and blue views. A window inset above the cabinets gives diners a glimpse of the hill and trees. "The family uses this house for Thanksgiving and all the holidays, so they needed a lot of kitchen storage, but it was blocking the views," Flato says. "We took out one cabinet and replaced it with a window." A dumbwaiter, tucked behind the kitchen wall, brings groceries up from the lower level. Its size is large enough to be retrofitted with a residential elevator if needed. 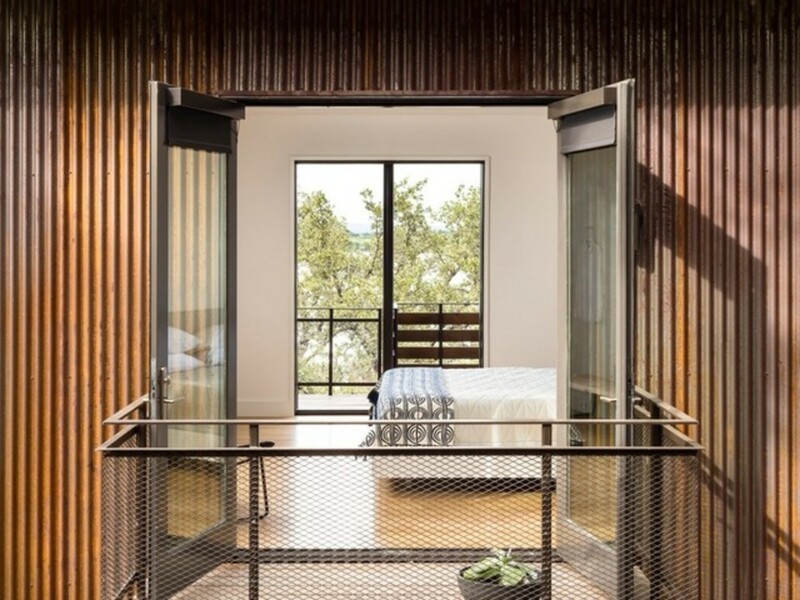 The master bedroom, on the second level, has a small balcony that overlooks the hillside. The doors on the opposite side lead to the outdoor hallway and stairs. 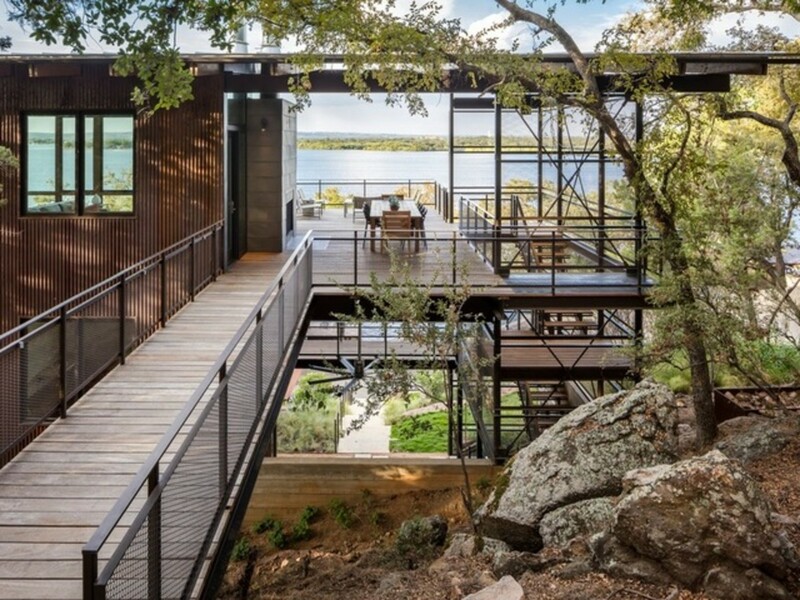 A bridge leads from the road to the upper level of the boathouse, which includes an outdoor kitchen that can be locked up behind sliding panels. The structure also includes a swim dock and boat slip below. "We repeated the same forms and materials for the boathouse," Flato says. "It echoes the main house."